The 2013 Honda Accord goes on a nationwide sale in the United States today. The 9th generation Accord flaunts style and sophistication and features a lot of new technologies. It is spacious, luxurious and is designed to give extreme comfort to all passengers including the driver. The new Accord Coupe and the new Accord Sedan, both now have noticeably shorter length which helps adding to the sporty character of the new Honda Accord. The seating area however, is still very generous along with a decent cargo space. The new Honda will have the HondaLink which is a cloud based system that helps one connect to Bluetooth Streaming audio, Pandora, internet radio etc. The HondaLink also helps access information like Facebook audio feeds, search for restaurants etc. via the audio system interface and recognition. It will also come loaded with safety features like Lane Departure Warning system, Forward Collision Warning and also gets the ACE body structure which helps enhance frontal crash performance. 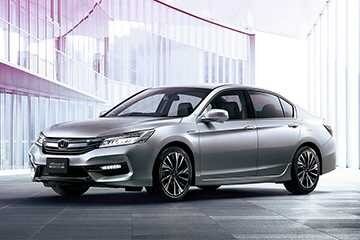 The new Accord stands against Toyota Camry, Nissan Altima, Volkswagen Passat and the likes. Accord and Camry beats the rivals in terms of fuel economy and reliability. The interiors flaunt high quality and with this new version Honda gets rid of the the busy dashboard and complex controls making the front of the cabin very neat. The base model, 2013 Honda Accord LX is powered by a 2.4-litre 4-cylinder engine mated to automatic transmission and is tagged at a price of USD 22,480, which is approximately equal to Rs. 12.13 lakh. The mid-range EX is tagged at USD 25,405, which in Indian currency works out to be close to Rs. 13.71 lakh for the automatic version. For last 36 years, Honda Accord has been one of the most celebrated vehicles in America and with the new 2013 Accord Sedan version that will go up on sale today and the Coupe that will come in on October 15th, it is expected that Honda will be able to rewrite its history. As for India, there is still uncertainty regarding the model and it is being said that Accord will be phased out but since official reports are still awaited, let’s wait and watch.